Not shown is an iPad and iPhone 4S, but you can see a large Samsung HDTV to the upper left tuned into CNBC or something similar. Also, if you look carefully you’ll find the screen on the left is running Parallels with Windows 7. Is this a great Mac setup or what? so…..should I buy AAPL right now or not? :) Nice setup. Making good use of those Office 2011 and iWork 09 books I see. 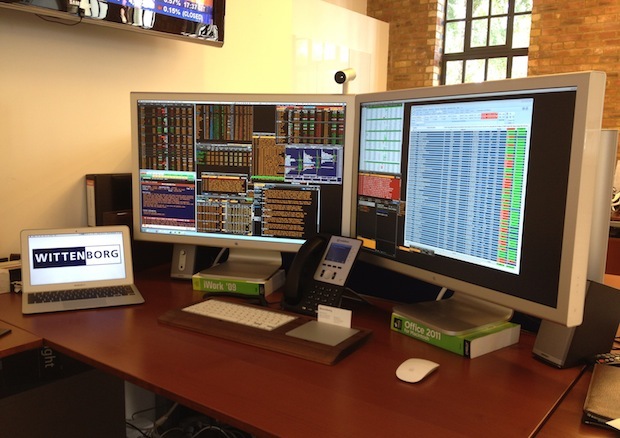 I have the same thing going on with Excel books from 2005, they make the best monitor risers! I really would like to know the name of the “keyboard and trackpad holder”. I love it and I must have one. What a nice wooden stand for the keyboard and trackpad. I wonder if it is custom made or you can buy it somewhere. Wow–what that accessory that the keyboard and trackpad are sitting in? Is that something custom made or can I buy that somewhere? Looks cool! I have one and love it. they make one for the iPad and a charging center but this is great for those of us who like to keep things together (or keep the keyboard on my lap). Nice setup. Wonder what a movie would look like stretched across those screens? Nice but $139 and 2-3 week delivery? I can have my local wood artist knock this out for me in 2-3 days … and get it made from Thai teak … under $20.00. Nice set up but, it looks like its running a version of WINDOWS !!!!!! The majority of share trading programs are only for windows, so I gather he’s using VM ware. Hey is he running Windows? In a virtual machine of some sort??? Which apps are running ? program on left is bloomberg, being run via citrix (for bloomberg anywhere) or some vm setup. subscription for bloomberg costs $2k per month last i checked, its cheaper and better just to get the terminal, which includes the bloomberg keyboard. I am a mac lover (use it at my work + home). At work I had to fight for it since it is a window$ shop all over. Said that I think the setup above is not efficient for the purpose. As a trader you are on your bloom all the time so you are fixed to your parallels (or a VM solution) all the time. You are basically running windows on expensive mac hardware. Whats an advantage in that? Max OSX is actually what makes macs superior. Also running windows through a VM has a performance hit.